The original was a corker, the follow up fishing fellow wasn’t so good. So we now have a new mega ad – The epic 90 second version of Into the Woods went live on Facebook and YouTube, on October 5th. Stage two is the 30-second pre-launch teaser on prime time TV, October 7th, and 8th, supported by movie listings advertising across News Limited publications. Campaign climax happens mid-October when the 60, 45 and 30-second films go to air on television and cinema screens across Australia. So all that said and done, is it any good? The new version seems to take the premise of “enduring the best” (which was most likely a reverse engineered / post rationalised proposition) and stretched it a bit too far. More of a story than an ad based on a product truth and a continuation of the creative campaign. Campaigns are precious things that need to have clear direction and it seems that John West might have lost their mojo in chasing the salmon in this one. Despite all that, the idea of enduring the worst to bring you the best is solid. A John West Facebook page provides an interactive platform where consumers are encouraged to be their best by sharing their achievements and getting a taste of the epic adventures of others. But as always, the adventures that John West presents in ads have to remain as relevant, motivating and interesting as possible. Having created some great work, they have a tough job to beat it. Few can compete with Resident Evil. The movies and games are guaranteed to sell by virtue of the strength and quality of the franchise. Most studios would bite off their right arm for this sort of selling power. As we near the release of Resident Evil 6, this quietly terrifying trailer is hitting cinema screens (not to mention the viral overload). It is brilliant in it’s understated and chilling simplicity and in the way it portrays the point we have reached in the story. Production values are top class, but like any horror genre, it’s what you don’t see that scares you senseless…and it also looks like the game. Resident Evil 6 is the dramatic and horrific fear inducing blockbuster entertainment experience of 2012, delivered by The Godfather of Survival Horror. • Experience the horror of Resident Evil 6 from three different perspectives. Feel the intense fear as Leon investigates the President’s murder; the horrific action as Chris fights in China and the tension as Jake escapes from Eastern Europe. • Face unpredictable enemies in Resident Evil 6. Zombies that run, jump and wield weapons plus the deadly J’avo that, when hit mutate into any number of hideous forms. A diminutive biscuit (cookie…) that hasn’t changed much about it’s appearance in 100 years is re-inventing itself. More than that, it is reformulating its advertising as well as it’s ingredients. 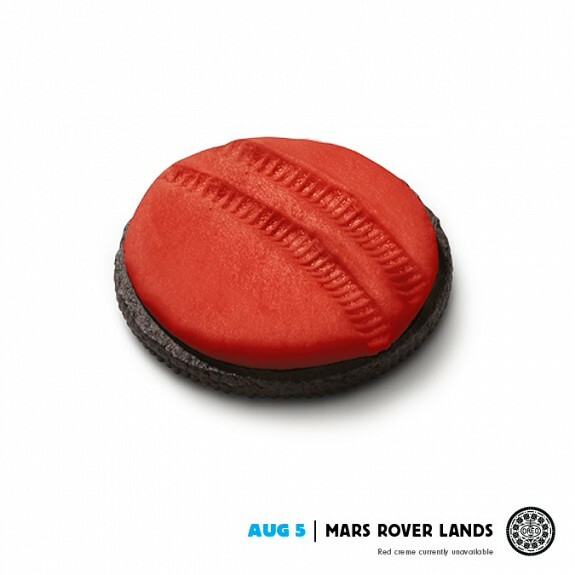 This ad does a nice job of making Oreo a bit more topical courtesy of the Mars Rover landing on the red planet. The Curiosity Oreo is not available in stores which is a bit of a blip in the strategy. Even as a PR giveaway it would have been outstanding. The red cookie follows in the footsteps of a previous space-themed, boot-printed cookie in honor of the July 20th anniversary of Neil Armstrong’s inaugural walk on the surface of the moon. And it is part of a much longer Daily Twist campaign. A rainbow cream stacked Gay Pride-themed Oreo drew over 65,500 comments (both supportive and opposing) on the company’s Facebook page and was shared nearly 300,000 times. Nicely understated and gaining popularity on-line!